Found 15 file extension associations related to WhatsApp for Windows Phone and 6 file formats developed specifically for use with WhatsApp for Windows Phone. WhatsApp Messenger is a smartphone messenger available for Windows Phone, Android, BlackBerry, iPhone, and Nokia phones. WhatsApp uses your 3G or WiFi (when available) to message with friends and family. Switch from SMS to WhatsApp to send and receive messages, pictures, audio notes, and video messages. How to backup and restore WhatsApp chat messages - Backup and Restore of WhatsApp conversions on Android, iPhone, Windows Phone or Blackberry. Transfer WhatsApp chats from phone to phone - Move your WhatsApp message history on Android, iPhone, Windows Phone and Blackberry platforms.. 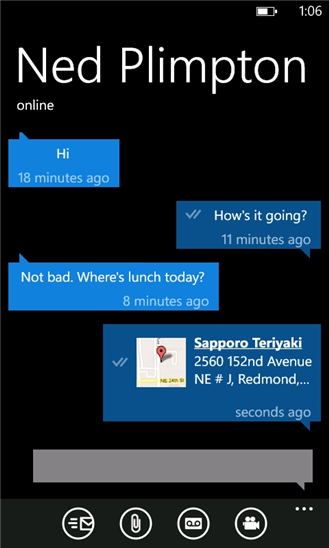 If you need more information please contact the developers of WhatsApp for Windows Phone (WhatsApp Inc.), or check out their product website.